Advances in corneal transplantation are improving outcomes and expanding indications for what is already the most common and most successful type of human-transplant surgery. Corneal transplantation, also known as keratoplasty, replaces a patient’s cornea, damaged by disease or infection, with donor corneal tissue. Four types of advanced procedures performed at UCLA are making a difference for these patients. 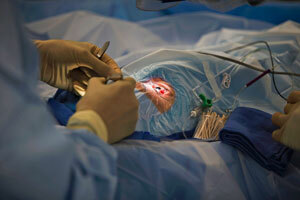 Descemet’s stripping endothelial keratoplasty (DSEK) allows for fewer intraoperative and postoperative complications, more rapid visual recovery and a more predictable prescription result following surgery than the traditional approach, says Anthony Aldave, MD, director of Cornea Services at UCLA Stein Eye Institute. The traditional surgery, known as full-thickness corneal transplantation or penetrating keratoplasty, uses a round, bladed “cookie cutter” called a trephine to make an incision through all layers of the patient’s cornea, restoring clarity by replacing the central cornea with one from a donor eye. For patients who develop corneal swelling and decreased vision from dysfunction of only the corneal endothelial cells — the indication for approximately 50 percent of the corneal transplants performed domestically each year, DSEK in now the procedure of choice, Dr. Aldave says. 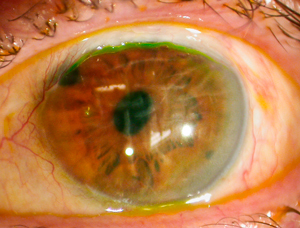 Image shows a patient with corneal swelling and advanced glaucoma. The procedure involves peeling off the diseased corneal endothelial cells and the Descemet membrane, to which they are attached, and replacing it with endothelial cells from a donor cornea, along with a thin amount of the overlying donor corneal tissue. The new inner layer is placed inside the eye and positioned using an air bubble so that the surface of the patient’s cornea isn’t touched. The incision is then closed with two sutures and most of the air bubble is removed 10 minutes after being placed. In addition to a faster visual recovery, many of the complications associated with full-thickness transplantation, including suture-related infections and associated irregular astigmatism, are eliminated. A complement to DSEK is deep anterior lamellar keratoplasty (DALK), a selective transplant procedure for patients with a corneal scar or keratoconus, but who have normal corneal endothelial cells. 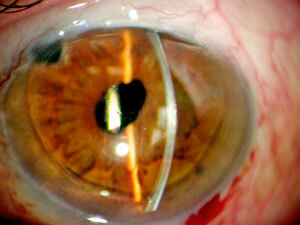 Rather than replacing the entire cornea, DALK replaces only the diseased portion. Like DSEK, DALK involves the injection of air, in this case to separate the corneal stroma from the underlying Descemet’s membrane and endothelial cells. By enabling the surgeon to preserve the inner layer of the cornea, DALK has several advantages over penetrating keratoplasty, explains Dr. Aldave. Because the inner layer of the cornea remains intact, the eye is not entered, and thus there is no risk of damaging the intraocular tissue such as the lens and the iris, and there is less chance of intraocular infection. In addition, because the healthy endothelial cells are not replaced, there is no risk of rejection and failure of the endothelial cells that are critical to keeping the cornea clear. Moreover, the requirements of the donor tissue are much less stringent than with the penetrating keratoplasty. Four years after Descemet’s stripping endothelial keratoplasty, the clear round donor cornea can be seen on the posterior surface and the patient continues to enjoy 20/20 corrected visual acuity. The third, and newest, approach to corneal transplantation at UCLA is lamellar and penetrating keratoplasty with a femtosecond laser. The laser replaces the trephine by using ultra-fast energy pulses to make incisions in the cornea. This enables the surgeon to create precisely shaped incisions so that the transplanted tissue fits into the cornea like an interlocking puzzle piece, resulting in faster visual rehabilitation and less astigmatism. The procedure is most appropriate for patients who have not had a prior corneal transplant or incisional corneal surgery and don’t have dense corneal scarring, says Dr. Aldave. It is ideal for patients with keratoconus, in whom the cornea is clear but misshapen, affecting their vision. As with DSEK, the femtosecond laser offers the promise of a decrease in astigmatism because of the precision of the laser, as well as a stronger wound that is more resistant to traumatic opening. Artificial corneal transplantation is an option for patients who are not candidates for traditional corneal transplantation or who have experienced corneal-transplant failure. The artificial cornea was considered experimental a decade ago, but today is an accepted treatment modality for an ever-expanding number of indications, says Dr. Aldave, who has performed 150 of the procedures, placing him among the three or four highest-volume artificial-corneal-transplant surgeons in the world. “We are finding that patients who previously had no hope of seeing after experiencing repeat corneal-transplant failure now have a viable alternative for reestablishing vision for a meaningful period of time.” Dr. Aldave’s results have been dramatic: Prior to the surgery, 92 percent of patients are not able to read the eye chart and could only count fingers, see movements of a hand or see light. One year after surgery, 63 percent of patients have vision between 20/20 and 20/100, a percentage that has remained relatively steady at three-year follow-up and beyond. Two developments in the last decade have significantly improved outcomes and led to the growing popularity of the procedure: modifications in the design of the device and the use of vancomycin and the advent of newer antibiotics that have dramatically reduced the rate of bacterial infections. “Traditionally, artificial-corneal-transplant surgery was considered only for patients who had two or more failed corneal transplants and those who had poor vision in both eyes,” Dr. Aldave explains. “Now, more than half of the patients for whom I perform this procedure have never had a corneal transplant or have had only one prior corneal transplant.” Among the patients in this group are those with corneal-limbal-stem-cell failure, who benefit from the fact that artificial-corneal-transplant recipients don’t require immune-suppression therapy.